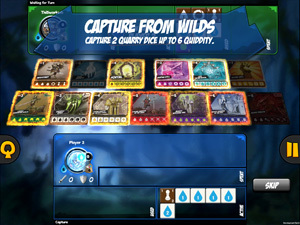 Quarriors is a digital adaptation of the award-winning dice-building game by Wizkidz Games. Quarriors is also the basis of Wizkidz Games Dicemasters series of games (Marvel, DC, D&D, Yugioh, etc...), adopting Quarrior's basic rules and mechanics while re-branding them into several commercially licensed collectible variants. The game supports single player versus ai and up to four players in local pass and play or online multiplayer. Quarriors is available for iOS for $3.99, with the expansion Quarmageddon available as an in-app purchase for $1.99. Quarriors is a dice-building game which borrows one of its key mechanics and part of its namesake from deck-building games, where players start with the same resources and purchase from a common shared pool. In the case of dice-builders, instead of buying a card from the shared trade set, a die representing that card is purchased and added to the discard pile. The card displays the six sides of its die across the bottom, showing the player in a glance at the possible stats that die will have when it it drawn and rolled. This dynamic of chance puts an interesting spin on typical deck building. Thematically the game utilizes basic fantasy tropes and has some nice vibrant art that caricatureizes the genre with some humor. The somewhat high luck factor in the game might turn off some heavy strategists but the game is meant to be somewhat light and fast. The fact that the game is based around dice rolling, which is obviously automatically simulated has been noted by some as a detraction with the app version lacking the tactile experience of rolling dice, but I found it to be sufficiently randomized to suit the purpose of the game. All in all it is a game that is fun in short busts for casual amusement. I have enjoyed it most playing single player and pass and play with someone on the same iPad. It is an easy game to learn and play, and can be quickly taught to children and non-gamers. While the app version's tutorial is lacking especially considering that the game is not very complicated, the video linked below does a good job of quickly explaining how to play.